If you haven’t done it yet, it’s time to take all the summer and autumn clothes out of your closet and make room for cosier and thicker clothes in order to adjust to the cold and windy weather that’s approaching. Winter is here, and while we might be longing for the summer again, at least the season in which we can wear our favourite sweaters, jackets and socks while drinking hot chocolate or eggnog is here. So, with this in mind, what are the essentials for your winter wardrobe? Forget about all the floral and colourful t-shirts (and shirts) you were rocking until now. Winter dictates simple and monochromatic t-shirts and shirts, without any patterns or eccentric prints. Why? Since you will likely be dressing in many layers, the best way to combine different t-shirts with pants and sweaters is if you had only minimalistic t-shirts. That way, you will be able to wear the same t-shirt more times this winter, without looking like you have nothing else to wear. Moreover, the minimalistic approach is very trendy now, so start your car and go get yourself simple tees in beige, brown, black or white. Many make the mistake of wearing sneakers and summer footwear during winter. It doesn’t matter if it’s not raining or not very cold, summer footwear is called that for a reason. 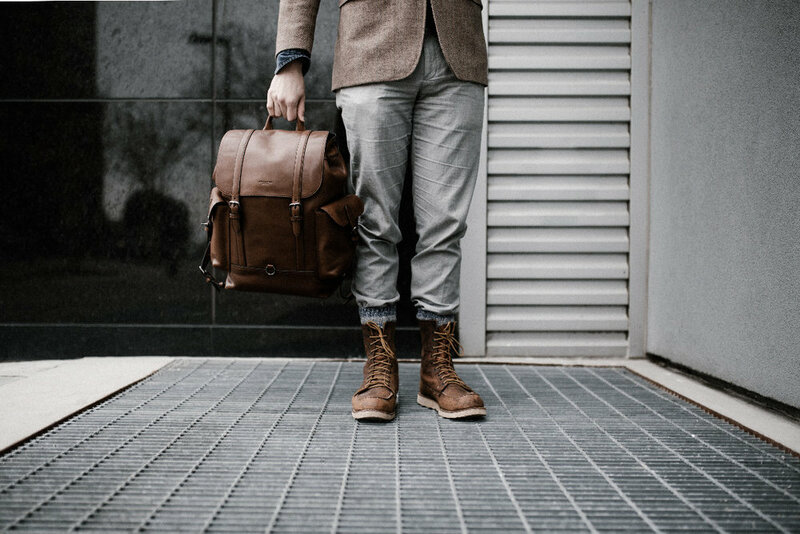 Since many people say that shoes make the first impression on them, having leather shoes will definitely enhance how people perceive you. Choose brown shoes – you won’t be in the wrong. If you want to add a nice, urban twist to your wardrobe, try ankle boots as they are very trendy nowadays. Not only does this design look good on you, but this height will keep you warm and protect you from the cold weather. However, if the weather is dry, you could perhaps pull off sneakers – but make sure they are white, simple, and not flannel. As The Neighborhood says, “let me hold both your hands in the holes of my sweater”. And if you want to do this, then you’ll need very beautiful and comfortable sweaters, right? As it is the case with t-shirts, the best sweaters you could have are monochromatic, due to the fact that you could easily match them to the rest of your outfit. However, winter is the only season of sweaters, so it’s advisable to have patterned ones since those also look amazing. Get yourself an “ugly” Christmas sweater and rock it only during December and around the Xmas tree (the word “only” cannot be emphasized enough). The worst thing you could do is wear the Xmas sweater after Xmas – save the patterned ones for then. If you pair a colourful sweater with plain pants and nice leather shoes, you’ll have yourself an excellent winter outfit. November and December are months in which you will probably have at least one formal event. Not to mention Christmas and New Year’s Eve, when it’s a must to look the best you can. For these occasions, it would be best if you had a nice, elegant suit. Make sure, though, to have a suit that’s designed for winter – meaning no ankle chinos, but rather regular trousers. You can find many great men’s suits in Melbourne that you could invest in for the upcoming holidays, so book a fitting and wait for all eyes to be on you this season. Winter is also the time of coats and jackets. If you want to add some flair to your style– a good coat is the key. Coats are excellent since they look very classy, and you can pair them with literally everything – jeans, sweaters, even sneakers. A coat is not only used as a layer of warmth, but of style as well. The best option is to get a coat the same colour as the shoes you’re wearing the most during winter. If they are brown – get a brown coat. Shoes (not talking about sneakers) of different colour than the coat might seriously clash. However, white footwear pairs well with any colour coat. So, to sum up – get yourself a coat this winter, and leave the jackets for some other time. These five items are definitely must-haves for this season. If you follow these tips and really get into the winter weather, you’ll surely look top notch this winter.